The chassis of the new Soul has also been redesigned to gain stiffness, poise and agility, especially in urban environments. 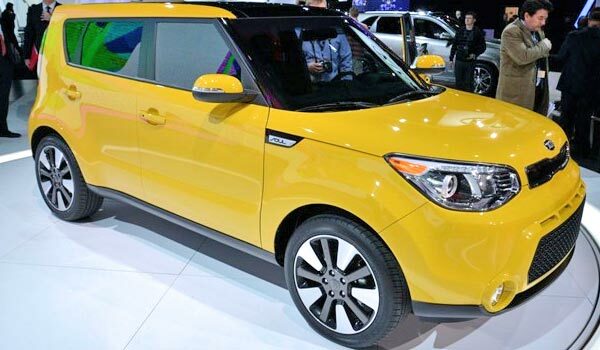 New Kia Soul 2014 yellow. 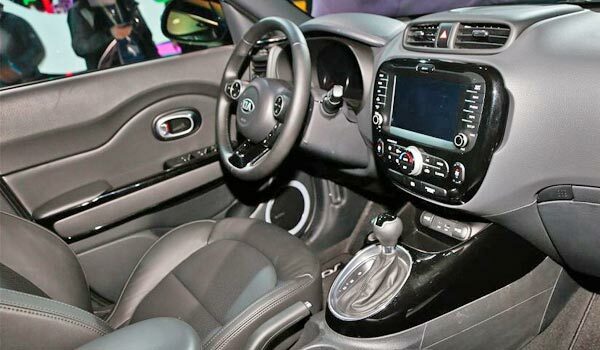 Driver cab, steering and front interior of the Soul 2014. In the past New York Auto Show 2013, KIA introduced its renewed crossover KIA Soul 2014, and now will take it to the old continent to exhibit it at the next version of the 65th International Motor Show 2013, which will be held in Frankfurt, Germany, from September 10th to September 22nd. In terms of mechanics, they will be offered with the latest versions of the 1.6L engines GDI gasoline or CRDi diesel. 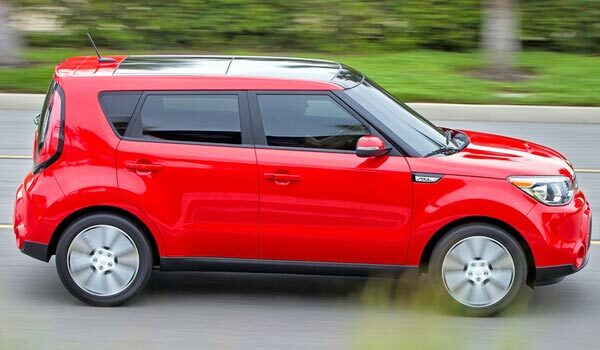 KIA Soul enthusiasts will also have the option to choose these models with both, six-speed manual transmission or 4-speed automatic. 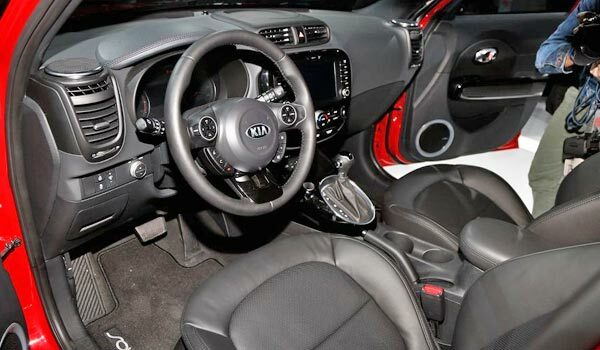 With regard to its appearance, the 2014 KIA Soul features a longer, wider and stiffer chassis, providing more interior space and cargo capacity. The KIA's design studio in California worked in conjunction with the main one located in Korea to improve the aesthetic without losing its unique imprint. 2014 Kia Soul driver seat, steering and dashboard. Furthermore, the increasing of its dimensions (excluding height which remains the same) gives to this Crossover SUV a more sporty and modern appearance. Among the comfort details that you can found include: panoramic sunroof, power heated folding exterior mirrors, leather upholstery, key-less entry, ignition button and automatic climate control. The unique funky style is one of the many highlights of the Soul. To the list of features can also be added: cruise control, heated seats and LED lights (front and rear) along with xenon headlights. On the other hand, KIA will give to the Soul a comprehensive customization package that modifies the look of the vehicle. Thus, customers will have the option of including accessories such as the lining in the bumper, side skirts, wheel arches and black painted roof. 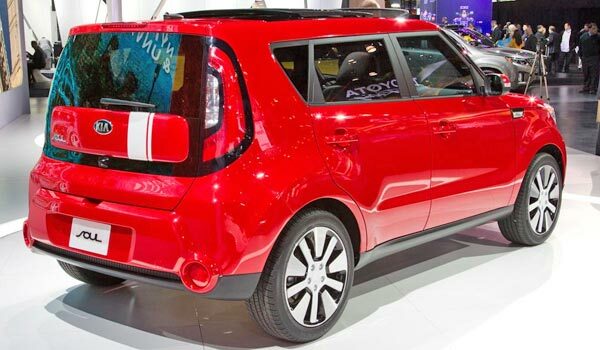 Rear view of the new Soul 2014. The KIA Soul will reach European markets early next year, after being one of the brand representatives in the Frankfurt Motor Show. In the U.S. market, it will be available on the dealership in this coming fall. There are many others vehicles more fun to drive in its class. On the positive side, we emphasize on its long warranty, ease of parking, user-friendly interior instruments, its unique hipster styling and strong brakes. As it is a cheap vehicle, don't expect high quality interior finishes. In any case, for being an ultra low-priced crossover SUV it comes with enough standard features for having an enjoyable drive. For less than $15,000 dollars, you will get all the practicality of a hatchback vehicle, although its cargo room is a little bit limited. TheCarConnection describes this crossover SUV as roomy, distinctive, fun to drive and a great alternative for other small utility vehicles. They also emphasize on its standing design and the many features you get for its low-price. 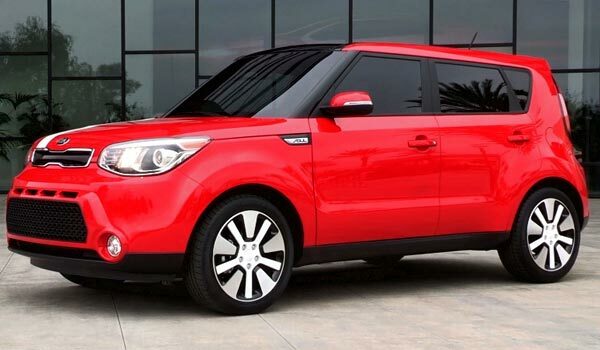 On the negative view, they think that the KIA Soul is slow and has no remarkable crash test scores. Video: 2014 Kia Soul commercial made by the famous dancer hamsters and the official song of Lady Gaga "Applause"
The Soul has an excellent acceptance among the users of Cars.com as its overall owner satisfaction rating is 4.7 out of 5 who mainly emphasize in its value for the money, interior design, comfort and performance besides some of its coolest accessories such as: standard Bluetooth connectivity, standard USB/iPod input, back-lit speakers and two different engine choices. The expert raters of the well known KBB (Kelley Blue Book) resource gave to this dynamic SUV an average of 7.3 out of 10, which is a relatively a low score. KBB highlights of the Soul its youthful spirit and the fact of being a cheaper alternative to hatchback and other economy cars. KBB reviewers are also in disagreement with its design and style, which they name as funky and which denotes a brash attitude.